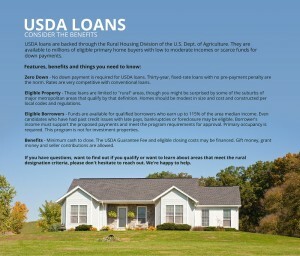 USDA loans are backed through the Rural Housing Division of the U.S. Dept. of Agriculture. They are available to millions of eligible primary home buyers with low to moderate incomes or scarce funds for down payments. Zero Down – No down payment is required for USDA loans. Thirty-year, fixed-rate loans with no pre-payment penalty are the norm. Rates are very competitive with conventional loans. Eligible Property – USDA loans are limited to “rural” areas, though you might be surprised by some of the suburbs of major metropolitan areas that qualify by that definition. Homes should be modest in size and cost and constructed per local codes and regulations. Eligible Borrowers – Funds are available for qualified borrowers who earn up to 115% of the area median income. Even candidates who have had past credit issues with late pays, bankruptcies or foreclosure may be eligible. Borrower’s income must support the proposed payments and meet the program requirements for approval. Primary occupancy is required. This program is not for investment properties. Benefits – Minimum cash to close. The USDA Guarantee Fee and eligible closing costs may be financed. Gift money, grant money, and seller contributions are allowed. If you have questions, want to find out if you qualify or want to learn about areas that meet the rural designation criteria, please don’t hesitate to reach out. We’re happy to help.